Claude Debussy. Very Good. In very good packaging. 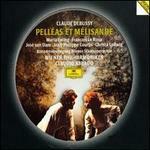 Debussy: Pelléas et Mélisande. Like New. Excellent CD Set with pamphlet and case! Clean. Appears to be unused. Fast Shipping. ~"Guaranteed quality or your money back"